The Common White Lilac, Syringa Vulgaris, is well-known and loved by gardeners all over the world for its beauty and fragrance; one of the most powerful fragrances emitted by a plant. This deciduous shrub is used as a hedge or as an individual accent plant. 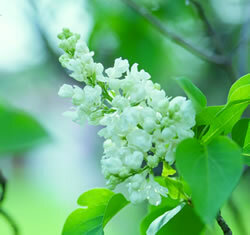 It has white flowers occurring in clusters amid the dark-green heart-shaped leaves. This species of lilac, the white lilac, produces suckers - new shoots that sprout from the base of the shrub, or from the roots. In North American gardens, this is a very hardy shrub. Lilacs can withstand severely cold winters (even -35 degrees C) and in fact the species does not grow well in areas without significant frost in wintertime. Captivating fragrance, gorgeous flowers.